The italicized abbreviations are not TBD-specific, or even health related, but those that are used throughout the WWW and Internet, found in all forums and email lists. A comprehensive listing of these abbreviations can be found in my Abbreviations & Emoticons page. If you would like to print this document out, it is available as a PDF file. Art = Artemisinin, a plant extract sometimes used to reduce Babesia levels in patients who cannot yet tolerate the multi-prescription drug required combo needed to kill the organism. Borrelia burgdorferi, the organism that causes Lyme disease. Bb is only one of over 300 known species and variants of Borrelia. CSM Cholestyramine, a drug normally prescribed to people with high cholesterol levels to help lower their cholesterol. It is also prescribed for people with high levels of neurotoxins (including those with TBI, and mold toxicity), as the CSM binds neurotoxins along with the cholesterol, which is then excreted by the body. CSM must be take with some fat (such as mixed in a beverage with cream), followed 30 min later by some additional fat. EM erythema migrans; the "classic" bull's-eye rash that appears in only 50% or so of tick bites, may or may not occur at the site of the bite, and may or may not look like a bull's eye (concentric rings around a center spot). herx Jarish-Herxheimer reaction: the exacerbation of symptoms or emergence of new ones as the body deals with the effects of the massive die-off of organisms caused by the antibiotic treatment. hx history, as in the patient's history as reported to a health care worker, or in context, such as "I have a hx of multiple tick bites over a period of 30 years in Borrelia-endemic areas but still the duck said I couldn't possibly have Lyme disease." IC take between meals. Also: interstitial cystitis. macrolide a class of antibiotic used in the treatment of some TBD. For example, Mepron, an anti-malarial drug + a macrolide antibiotic (usually Zithromax) is used in the treatment of Babesia. MCP Modified citrus pectin. Citrus pectin that has been processed to reduce the molecular size, increasing its bioavailability, has been used in the treatment of certain types of cancers, and in heavy metals detoxification. There is some indication that it may be useful in binding with neurotoxins, similar to CSM, and so may be useful to those who need a prolonged course of treatment to reduce their neurotoxin load. MMP-9 Matrix metalloproteinase (MMP; MMP-9) are enzymes that open tunnels through the tissues of the body in order to deliver inflammatory cytokines and other biochemicals. MMPs are essential for substances to be able to move around the body, but excessive levels of MMPs develop when inflammation is too high. MMP-9 is frequently discussed in relation to people with TBI. High levels of MMP-9 means high levels of cytokines are being delivered to body tissues, causing lots of trouble everywhere else. This, elevated inflammation = elevated cytokines = increased inflammation and elevated risk of other inflammatory diseases. mold Many with TBI are also susceptible and are made ill from exposure to environmental molds. A home or office does not have to actually have black slime mold dripping down the walls--or any visible mold--to be infested with mold at levels high enough to cause illness. Salt/C An experimental unproven and potentially dangerous protocol where patients ingest extremely high quantities of salt and vitamin C every day for several months. Staph Staphylococcus, a spherical gram-positive parasitic bacteria that tend to form irregular colonies. Colonies may cause boils, or septicemia, or other infections. Many people with TBI have been sick so long that they have become ill from colonization by organisms normally present in such low numbers as to be considered benign. Staph a (S. aureaus) and S. epidermidis are two such infections commonly causing illness in people also ill from TBDs. Appropriately collected nasal swabbing is done to collect material for culture and sensitivity testing, to determine what species of Staphylococcus is present, and what drugs it is susceptible and resistant to. 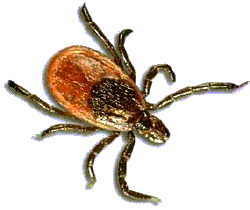 Tickborne disease, that is, diseases caused by parasites living inside ticks which are transferred to a new host when the tick injects its parasite-laden saliva into the bite through which it is drawing its blood meal. These parasites can then be transmitted to other feeding ticks, fleas, and other biting insects, such as flies and mosquitoes, who then transfer them to the hosts they feed on. Once infected, host animals may transmit some of these diseases sexually, as well as infected females able to pass them through the placenta and breast milk. The TBO (tickborne organisms) we are most concerned with are those in the following genuses Borrelia (borreliosis, aka Lyme disease; Bartonella (bartonellosis, aka cat-scratch fever); Babesia (babesiosis), and Ehrlichia (ehrlichiosis). TBI Tickborne illness. Illnesses or infections caused by organisms transferred from ticks to humans and other animals. Those associated with Lyme disease are Borrelia (borreliosis, aka Lyme disease; Bartonella (bartonellosis, aka cat-scratch fever); Babesia (babesiosis), and Ehrlichia (ehrlichiosis). See TBD. WB Western blot. The IgG and IgM Western blot tests for Borrelia provides results in a way that gives a sort of visualization of the patient's antibodies. It is more sensitive and specific than the ELISA and EIA (that is, it is more likely to show positives where the ELISA/EIA showed negatives). The IgG and IgM WB should always be used when the Lyme IgG/IgM antibody serology has returned an equivocal or positive result. To find out more about nonspecialty lab tests, see LabTestsOnline.org. To find out more about drug dosing, see my Drug Dosing & Routes of Administration.